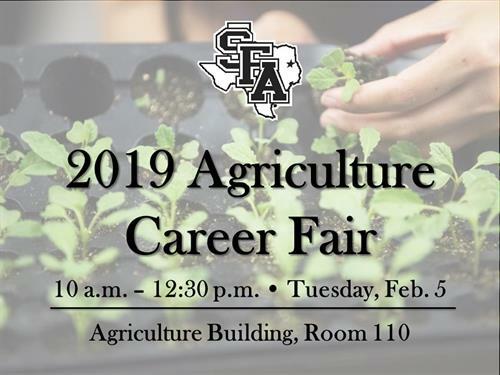 In collaboration with the Center for Career and Professional Development, the Department of Agriculture at SFA welcomes you to recruit SFA agriculture students for available full-time and internship opportunities. The Department of Agriculture at SFA offers multiple specialized academic tracks to prepare students for career opportunities and ensure they are equipped to face the challenges of a growing, globalized world. Students may hone their specialties in agribusiness, agricultural development, agricultural engineering technology, animal science, horticulture and poultry science. Furthermore, students obtain firsthand experience in their designated field throughout their undergraduate career, a characteristic that distinguishes our program from many others. Early-Bird price of $100 before January 14. Standard price of $150 after January 14. Tuesday, Feburary 5th from 10 AM - 12:30 PM.